Since it was established in 1951, ONEX Corporation has taken a leading position in the industry as a comprehensive metal heat treatment service provider and equipment manufacturer, having accumulated a wide range of carburizing technologies that include vacuum heat treatment, high-frequency heat treatment, nitriding treatment, and ceramic coating. Based on its principle of always putting the customer first, ONEX aims to make further technological advances while leaping ahead of the competition as a leading listed company specializing in heat treatment. Japan’s economy remained on a course of gentle recovery during this consolidated fiscal year, with both employment and personal income continuing to improve alongside recovering capital investment and exports. Overseas, the US economy maintained its course of steady recovery, the European economy experienced gentle recovery, and the Chinese economy appeared to regain some momentum. Nevertheless, the growing risk of fluctuations in foreign exchange, financial, and capital markets leaves the future outlook increasingly uncertain. Factors contributing to this uncertainty include economic uncertainties overseas and geopolitical risks in the Middle East, North Korea, and elsewhere. Given these economic conditions, the ONEX Group sought to increase profitability by boosting productivity and cutting costs. In our most important markets—auto parts, construction machinery, and industrial machinery—orders received for construction machinery remained sluggish, though appearing to have bottomed out in certain areas. Orders received for industrial machinery grew, especially for products such as reduction gears for robots, while conditions were favorable for orders received for auto parts. Overall, net sales increased from the previous fiscal year. Profits rose from the previous fiscal year due to lower production costs, including lower electricity charges, and the results of various measures taken to reduce expenses. 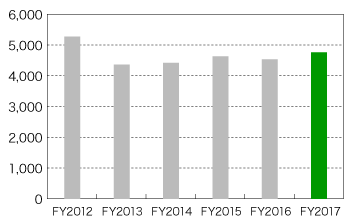 As a result, during this consolidated fiscal year, net sales stood at JPY5,476 million (up 6.3% YoY). 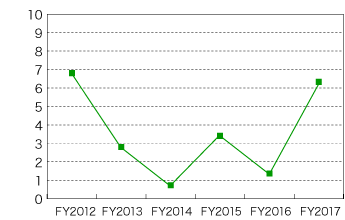 Operating income was JPY288 million (vs. operating losses of JPY32 million in the previous fiscal year); ordinary income JPY294 million (vs. ordinary losses of JPY27 million in the previous fiscal year); and net income attributable to shareholders of the parent company JPY128 million (vs. net losses attributable to shareholders of the parent company of JPY85 million in the previous fiscal year). Performance by business segment is outlined below. In the metal heat treatment and processing industry, overall orders received trended up, with favorable conditions for orders in the key automotive market. Orders for industrial machinery also grew. While orders for construction machinery were sluggish, they showed signs of bottoming out in certain areas. In addition, net sales generated by ONEX Tech Center Corporation grew, resulting in net sales growth from the previous fiscal year. Segment profit increased due to lower electricity charges and the fullest efforts exerted to secure profitability implemented through measures to boost productivity and cut labor costs and miscellaneous expenses. Due to all these factors, net sales in this segment stood at JPY4,874 million (up 5.9% YoY), while segment profit was JPY232 million (vs. segment losses of JPY87 million in the previous fiscal year). Net sales in the Logistics Business grew due to growth in sales volumes accompanying the opening of the Mie Office, as well as stable volumes of machinery and other heavy cargo handled. However, despite efforts to ensure thorough operations management, to increase vehicle allocation efficiency, to reduce fuel consumption through eco-friendly driving practices, and to outsource activities requiring trucks, profits in this segment fell for various reasons, including higher labor costs generated by the need to secure human resources and higher depreciation costs. Net sales in this segment stood at JPY601 million (up 9.9% YoY); segment profit was JPY21 million (down 12.0% YoY). Our current economic outlook anticipates gentle recovery due to the effects of various policies. Nevertheless, downside risks for economy are rising due to trends in exchange rates and crude oil prices; growing uncertainty in overseas economies, including China, other emerging markets, and resource-rich countries; and fluctuations in financial and capital markets. Amid these conditions, based on expectations that competition will intensify, we plan to establish the structure needed to be more responsive to customer needs. This will involve expanding ONEX Tech Center Corporation’s Mie Office and making the most of our network of business facilities. We will also strive to strengthen our corporate structure. For this purpose, we will review our sales structure, expand our customer base by increasing domestic and international orders, and improve profitability based on improvements in efficiency and reductions in costs and expenses. In the metal heat treatment and processing industry, orders received are expected to remain strong for the key automotive market and for reduction gears for robots in the industrial machinery industry. We expect this trend to lead to increased net sales. Our forecasts of Group consolidated business performance for the next fiscal year call for net sales of JPY5,676 million (up 3.6% YoY), operating income of JPY296 million (up 2.5% YoY), ordinary income of JPY308 million (up 4.7% YoY), and net income attributable to shareholders of the parent company of JPY188 million (up 46.2% YoY). 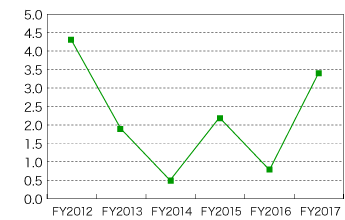 During this consolidated cumulative third quarter, Japan’s economy remained on a course of gentle recovery, with both employment and personal income continuing to improve, although some companies apparently lagged in the pace of this improvement due to rising energy prices as the fall in crude oil prices slowed and the yen trended lower on international currency markets. Overseas, the US economy maintained its course of steady recovery, while the Chinese economy appeared to regain some momentum. The growing risk of fluctuations in foreign exchange, financial, and capital markets makes the future outlook increasingly uncertain. Factors contributing to this fluctuation risk include Britain’s withdrawal from the European Union, political developments in leading European states, a change in economic policies under the new US President, and geopolitical risks in the Middle East, North Korea, and elsewhere. Given these economic conditions, the ONEX Group sought to increase profitability by boosting productivity and cutting costs. In our most important markets—automotive, construction machinery, and industrial machinery—orders received for construction machinery appeared to bottom out but remained sluggish. Orders related to industrial machinery grew for products such as reduction gears for robots, while conditions were favorable for orders received related to auto parts. As a result, net sales increased from the same consolidated cumulative quarter of the previous fiscal year. The lower cost of electricity and other production costs and efforts to reduce expenses resulted in higher profits compared to the same consolidated cumulative quarter of the previous fiscal year. 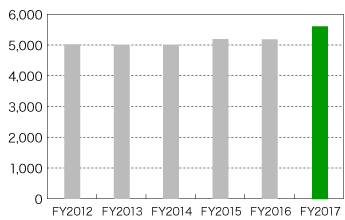 As a result, during this consolidated cumulative third quarter, net sales stood at JPY4,049 million (up 4.9% YoY). Operating income was JPY245 million (up 16.8% YoY), ordinary income JPY245 million (up 16.0% YoY), and net income attributable to shareholders of the parent company JPY113 million (up 4.8% YoY). In the metal heat treatment and processing industry, overall orders received trended up, with favorable conditions for orders in the key automotive market. Orders for industrial machinery also grew. While orders for construction machinery were slow, they showed some signs of bottoming out. In addition, the net sales generated by ONEX Tech Center Corporation grew, resulting in net sales growth compared to the same consolidated cumulative quarter of the previous fiscal year. Segment profit increased due to lower electricity costs and success in implementing all measures to secure profitability by boosting productivity and cutting labor costs and miscellaneous expenses. Due to all these factors, net sales in this segment stood at JPY3,592 million (up 4.4% YoY), while segment profit was JPY199 million (up 24.6% YoY). Net sales in the Logistics Business increased due to increased sales volumes accompanying the opening of the Mie Office, as well as stable volumes of machinery and other heavy cargo handled. 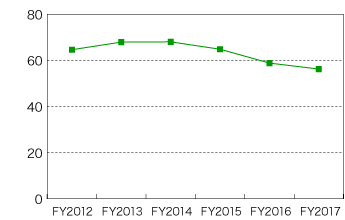 Despite efforts to ensure thorough operations management, increase the efficiency of vehicle allocation, reduce fuel consumption through eco-friendly driving practices, and outsource activities requiring trucks, profits in this segment fell for various reasons, including rising diesel oil prices, rising labor costs, and increased depreciation costs accompanying an increase in the number of vehicles. As a result, net sales in this segment stood at JPY457 million (up 8.9% YoY). 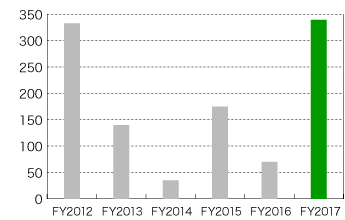 Segment profit was JPY20 million (down 26.1% YoY). Total assets rose to JPY10,033 million, up JPY880 million from the end of the previous consolidated fiscal year, due mainly to an increase of JPY885 million in cash and deposits. 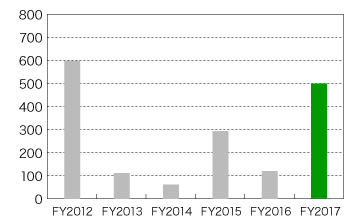 Total liabilities rose to JPY4,751 million, up JPY755 million from the end of the previous consolidated fiscal year, due mainly to an increase of JPY689 million in long-term debt. 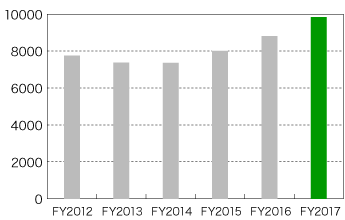 Total net assets rose to JPY5,281 million, up JPY124 million from the end of the previous consolidated fiscal year, due mainly to increases of JPY80 million in retained earnings and JPY44 million in valuation differences on available-for-sale securities. Please send any inquiries on investor relations to the following e-mail address. Copyright © ONEX CORPORATION. All rights reserved.